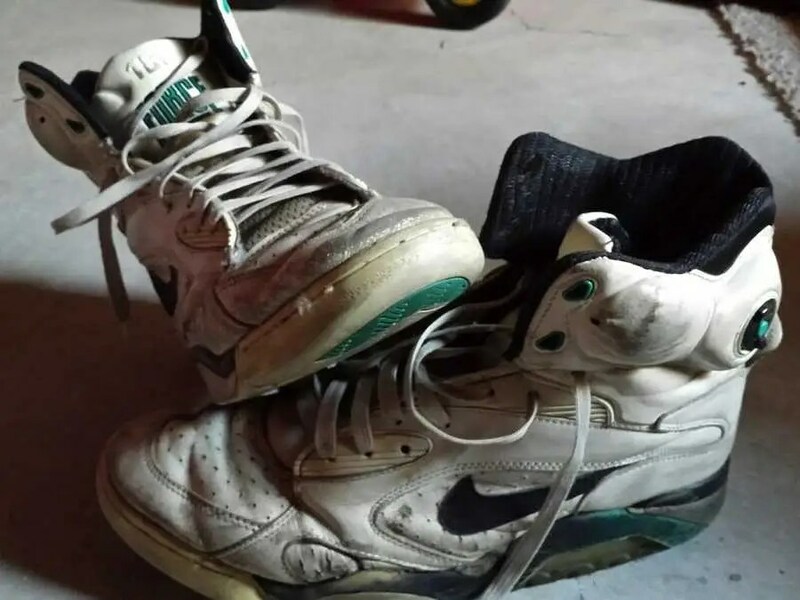 Do you still have a pair of shoes that are 22 years old? I do. They still fit, but that isn’t why I keep them. I haven’t worn them for more than two decades. They are beat up and have no traction, which is kind of important for a basketball shoe. I keep them, despite pleas from everyone to throw them out, because of the lesson they taught me and that I never want to forget. Back in the early 90’s, when I was a young teenager, I wanted to have the very best. Since I was easily influenced by marketing and friends, I wanted to have the first pair of Nike Air Force 180 shoes. How could you pass up the Admiral, David Robinson, and the commercials that went with it (now that I watch it 20 years later, it’s pretty embarrassing, but I promise it was awesome at the time)? I don’t even like the Spurs — I’m a Jazz fan — but Mr. Robinson was pretty awesome, plus there just aren’t a lot of good athletes to admire. But anyways, that’s off-topic. These shoes I wanted cost $150, and this was back in the early 90’s. I didn’t have a job because I was a young teenager, so I was cutting lawns for neighbors, and to earn $150 was a major accomplishment getting $5 a at time. So I saved and saved and went to the mall to check out when the shoes were going to come out so I could be there the very first day. I finally had $150 saved and went to the mall. I had to have mom drive because I couldn’t drive and she said, “Are you sure you want to spend all your money on these shoes?” I said yes, and luckily she said okay. Looking back I am grateful she didn’t stop me and allowed me to make my own mistakes. That is an important lesson she taught me, and I hope to pass along to my kids. If you force them to avoid mistakes, they will never learn until later in life, when mistakes are potentially economically shattering. So I walk in to the store, and they said I was the first one in the whole state to get these new pair of Nike Air Force 180 shoes and they were giving me 10% off because of that. WOW! New shoes, plus I get to keep $15. Life just keeps getting better and better. I got my size 11 shoes. I was a giant kid back then and thought I would be an NBA player, but stopped growing after that. I headed home and they told me at the store to not wear them anywhere but the gym because of the air pocket in the bottom of the shoe. But how would all my friends and all the kids at school see me with my new cool shoes? So I decided to wear them whenever I felt like it. After all, they were my shoes now. The awesome thing about basketball shoes back in the early 90’s was the invention of the pump. Not only could you get high tops, but now they came with pumps. If you could pump up your shoes, you could do anything. Even better: You could move the knob at the top and not only pump up where your arch was, but you could pump up around your ankles. Two pumps! Talk about technology. I also had no money because I spent everything I had on that pair of shoes. What about that 10% I saved? Well I didn’t factor in sales tax, so really $150 shoes don’t cost $150. You have to add in tax, so I lucked out with the 10% off and ended up paying tax with that money I thought I was saving. I had cool shoes, no money, and still couldn’t make it past the first cuts for junior high basketball. I even got a tiny sliver in to the bottom of my shoe that drained the air out of the one pouch because I wore them everywhere instead of just the basketball court. I wore these shoes for several years until I needed a slightly bigger pair of shoes and the traction was gone. I didn’t want to get rid of them because I spent all my money on them. This was my first big purchase and it was a big deal to me. But I sure learned the difference right then about marketing, keeping up with the “Joneses,” and managing money. I’ve applied this lesson in to everything else in life. The interesting thing is that I almost went to the other extreme of saving everything I earned. I would save 80-85% of all my money as a teenager with my job at a golf course cutting greens and fairways. I didn’t spend it on anything, so I probably missed out on doing some fun things, but I also was able to use all that money to pay for college so I graduated with no debt. If you can do that, you are set … or at least have a huge start. But what about everything else we do? These shoes can be compared to any other purchase we make. “I must have the biggest house and the latest car.” Do you spend everything you have, and probably much more than you should, just to become house poor or to have huge car payments? You only realize later on that your car still just gets you from A to B just like most cars, and a larger house just means more to clean and a tighter month to month payment with no wiggle room. Then, when an emergency pops up or a major car repair forces you to take on more debt and load up your credit cards, you get into further trouble. The earlier this lesson comes to you in life, the easier life can be. However, that doesn’t mean it’s too late to ever start learning about money. Just because you have learned it once doesn’t mean you are an expert for life and can’t improve upon what you already know. So my $150 shoes ended up costing me big as a teenager, but probably saved me hundreds of thousands with my house and cars. We qualified for well over what we were looking at when going for a mortgage, and it was really tempting to max it out and get a mini-mansion instead of a regular home. On the one hand, it would be awesome to have a big nice house. It would sure impress everyone, but leave us scraping every single month for money. If we go with a regular house, we would be able to easily afford the payment and we would already have our daughter’s college fund already done as well, and at the time she wasn’t even born yet. If we can get over worrying about what everyone else thinks and just worry about ourselves and have the big picture, life gets much easier to deal with. It is your life, not everyone else’s life, so stop worrying about what they think.